The following commentary was written by Float’s managing director, Chad Udell. Well, another week down, another conference over. I just returned from ASTD TechKnowledge 2012 held at the Rio Suites Hotel and Convention Center in Las Vegas. It was a show filled with ideas, conversations and revelations. Sounds typical, right? Well, yes and no. This was Float’s first trip to a national ASTD event. We’ve had a bit of involvement in our local chapters, giving talks, hosting networking events and enjoying the connections it’s brought. Beyond that, we’ve recently started giving online Web-based training via webinars for ASTD in the Essentials of Mobile Learning seminar series. This has been well received, with plans to continue this in 2012. When I got accepted to present on prototyping at this great annual technology in learning event held by ASTD, I was very pleased to accept on behalf of the company, knowing it was going to be great. I arrived late Monday evening; I was tired, but ready to meet a lot of people for the first time, and get a bright and early start on the show the next day for the full-day workshop. It turns out the workshop was pretty packed, really, with about 15 people wanting to learn about rapid design and prototyping for mobile. We spent the morning giving some basics on mobile learning design and development and offering some responses to Q&A from the learners. Overall, it was a great discussion. In the afternoon, we took a deep dive into the mobile learning onboarding app for a fictitious company “MegaCorp.” This app featured typical onboarding information such corporate history, a message from the CEO and other content usually delivered in a new employee orientation. We also spent some time brainstorming on what sorts of content would be good to have in an app about the company that might not typically be delivered in an onboarding course. The discussion was fruitful, with a lot of people starting to potentially rethink what a mobile learning app for this purpose could be. Locations with maps, phone directories, quizzes and more were all envisioned and sketched. With that day done, it was time to unwind, meeting some great people for dinner along with some excellent conversation with colleagues. It is always one of my favorite aspects of a conference. I feel as though you can often learn just as much, if not more, about how people go through their days and get things done by sharing a plate of Tandoori chicken than you can sitting in a session seeing their presentation. The keynote delivered the next day really shone a light on gaming, mobile and social; these are topics that are obviously on everyone’s radar for 2012. It’s exciting, for sure. When you consider the hours these games are played, the penetration these devices have, and the usage that these sites and apps get, it’s plain to see that massive changes are underfoot in how learning occurs and how we can reach our learners. ASTD CEO, Tony Bingham walked the audience through an astounding array of how this already impacting our daily lives and it didn’t stop there. He introduced Jane McGonigal, author of “Reality is Broken.” What a great talk and a wonderful exploration of how gaming’s collaborative and motivational aspects are being used to solve some of the most difficult challenges facing humanity, and even battling personal social problems like depression and obesity. Really cool stuff indeed. We played a MMO version of thumb wrestling. It was fun. I still lost. After Jane’s great talk, I ended up presenting a Creation Station on using jQuery Mobile to build apps and mobile websites for smartphones. This was originally to be presented by Jason Haag from ADL, but due to an emergency, he was unable to present. I was happy to be able to help out when the event organizers asked me, and even happier when I saw just how well organized the session and the assets were. The session went well and I presented it once again the next day. Thanks for the opportunity, Jason and ASTD. It was a lot of fun. In the afternoon, I attended Leaving the ADDIE Model Behind presented by Dr. Michael Allen from Allen Interactions. Dr. Allen presented how Allen Interactions has moved away from ADDIE as their production process and moved to something more closely resembling Agile Programming due to its iterative approach using high velocity cycles and integrated use of stakeholders throughout. I was heartened to see such an esteemed member of the learning community extolling the virtues of such an approach. At Float, we’ve been using a similar process since our inception. I strongly feel that your company must own and live the process you use. So, if ADDIE isn’t working for you and your workgroup anymore, it may be time to move on. Check out the process here. Tim Martin rounded out the first day by sharing “Beyond Shareable Content Object Reference Model: Supporting Future Learning Experiences.” Tim presented the Project TinCan effort that has been underway for a while now. As someone who has been following this “next generation of SCORM” discussion for at least three years via discussions with ADL, LETSI and others, I am so happy to see such direct action taking place in this area. It’s plain to see out there that SCORM is simply tired and being overworked and is due for a modern, scalable, flexible replacement. Project TinCan looks to be just that. Don’t know much about it? Watch this video to get a start on learning about it. Day two of the event was also eventful. While I was unable to make the keynote due to prior commitments, the ASTD Twitter feed suggested that Facebook’s Stuart Crabb gave an informative, if maybe a little predictable, presentation. There was lots of talk about generational gaps in how people learn. Since much has been made of this in the past by lots of others, it may not have been seen as being all that unique. He did use the Facebook Timeline as a presentation tool, though, so that was kind of a cool, if not a little bit of a subversive, use of the new tool from Facebook. I think that a lot of people were thinking that there would be some top-secret reveal that Facebook has a massively different process for training their staff. Wishful thinking, really. Sure, Facebook does a bit of trial by fire and makes people start contributing immediately, but is that really so novel today? Cammy Bean has a great blog post on the talk. After the keynote, I gave the jQuery session again. I think things went even better on the second time around. All in all, I was happy to be able to help out and really enjoyed going over this content. After a quick lunch, I went to Reuben Tozman’s talk on Instructional Design for a Semantic Web. I really enjoy this subject, and Reuben is an expert in it to be sure. I really enjoyed seeing just how far his work has progressed, and was happy to see that so many people are starting to show an interest in the topic as well. The final session of the day (and the conference for me, since I had to travel the next morning), was Enhancing Learning With GPS and Augmented Reality on Mobile Devices from Todd Hudson. Todd heads up Maverick Learning. Maverick seems like a very interesting group of individuals. The use of LEAN in learning is a concept definitely worth exploring. Todd coupled an intro on that methodology with an overview of some great examples of how augmented reality and GPS could be used in mobile learning. I enjoyed Todd’s talk tremendously. It’s always fun to see some creativity applied and then sit back and watch the engagement and discussion. A great time! So, getting back home and having some time to reflect, I have thought a bit more about this event and have to say… Very nice work indeed, ASTD! I feel that the venue could have used some work, but on content and attitude, they pulled off a winner here. I’m looking forward to a productive 2012, and judging by the others at the event, they are, too. Two members of the Float team are hoping to present sessions at Techweek in Chicago this coming June. But those sessions are curated by voting. Float managing director Chad Udell looks to host a panel featuring industry thought leaders, while Float managing partner Scott McCormick wants to guide companies in deploying enterprise mobile apps. To view more information on the sessions, visit this post on our blog. Voting ends February 16. Two Float team members will present at Training Magazine’s Conference in February. 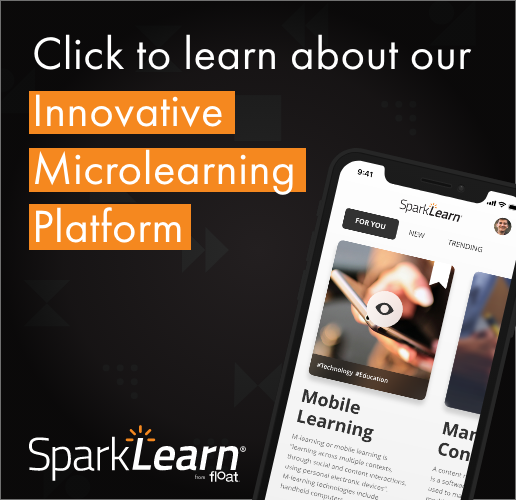 On Feb. 14, managing partner Scott McCormick will present the Ten Questions You Need to Ask Before You Adopt Mobile Learning. The next day, Feb. 15, managing director Chad Udell presents Design Approaches for Adapting Content for mLearning. More than 80 percent of doctors in the United States have adopted either smartphones or tablets, but less than 1 percent of hospitals have fully functioning tablet systems, according to an analysis of research from our experts. Co-authored by Float senior analyst Gary Woodill and Float managing director Chad Udell, we will be releasing three more environmental scans related to mobile learning and applications in healthcare. The scans, available later this month, will look at mobile applications for the management of hospitals and medical practices; mobile learning applications for wellness, self-care and home care; and mobile learning for training in emergencies. Late last year, Float released the first half of our healthcare research. Those scans look at performance support, professional education applications, and the future of mobile learning in medicine and healthcare. To download these, visit Research Papers page.